HILLIARD, Ohio - April 12, 2016 - PRLog – IDEAL Group, Inc. today announced that it was selected to develop the world’s first commercial multi-lingual/dialect, speech-driven, real-time captioning service. This unique cloud-based service will offer tens-of-millions of consumers and organizations worldwide, low-cost captioning services that are impressively accurate. Hundreds-of-millions of people worldwide who are deaf, hard-of-hearing, or deaf-blind are being disenfranchised because events they wish to participate in are not live captioned. A recent Johns Hopkins study (2012) cites 48 million people living with hearing loss in the USA, alone. Worldwide this number skyrockets to more than 360 million consumers. While American Sign Language (ASL) is a good option for some individuals, many people are unable to benefit from ASL. These individuals include late-deafened adults, individuals who lost their hearing early in life after acquiring speech, individuals who are deaf-blind, and individuals who are hard-of-hearing who never learned ASL. 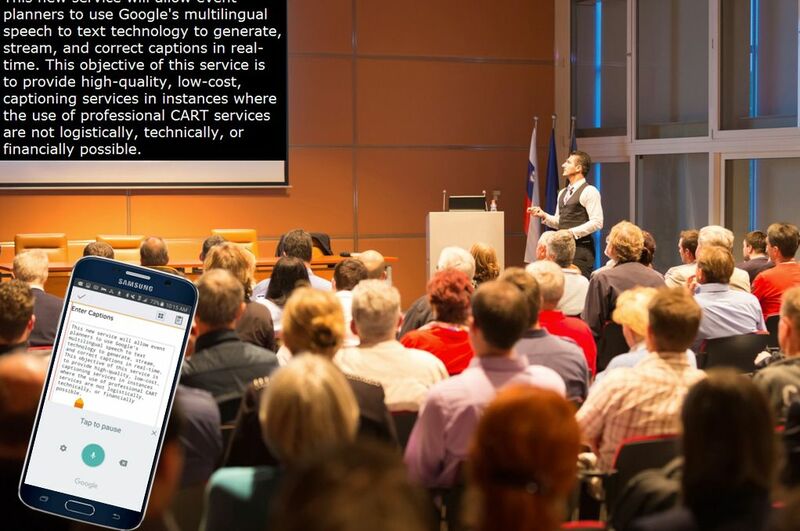 Many small organizations who host webinars, online courses, and other types of events and meetings cannot afford to offer live captioning (CART) services. The reason is that CART services can be very costly, sometime exceeding $125/hr. This new service is being designed to “fill this gap” by providing high-quality, low-cost, captioning services in instances where the use of professional CART services are not logistically, technically, or financially possible. This new service will be exclusively managed and controlled by TDI (formerly Telecommunications for the Deaf and Hard of Hearing, Inc.) with the support of a $500,000 Google Impact Challenge: Disabilities grant. This entry was posted on Sunday, May 22nd, 2016 at 8:12 am. You can follow any responses to this entry through the RSS 2.0 feed. Both comments and pings are currently closed.